~ "One interest will prevail . . . Christ our righteousness." Every once in a while, I feel the need to highlight the “New England” part of my blog title – and this will be one of those instances. Everyone probably knows, of course, that I have a real affection for the region of the United States in which I was born and in which I’ve spent almost my entire life. But after returning from a brief family camping trip last night to a new part of Maine to which I’ve never been, I thought I would both share some pictures I captured (simply on my iPhone) and explain why it is that I love Maine so much – all the while trying to draw some type of spiritual lesson. Though there are many, many reasons why I love Maine so much, here is one of those reasons which is chief: there is so much of it to discover! It is actually quite astounding: Maine is a very, very big state – especially for the standards of the northeastern United States – and it is very sparsely populated (the most sparsely populated state east of the Mississippi River). As a result, there are some very hidden and out-of-the-way places here, and I seem to be discovering some of those places a lot lately. The chief reason for this, which many people “from away” don’t recognize and appreciate, is that though Maine’s coast, from its southern point to its northern point, is only 228 miles if one were to draw a straight line. But taking into consideration all the peninsulas and coves and harbors and islands, that coast actually stretches out to 3,478 miles – which is the fourth longest coastline in the entire United States (only Alaska, Florida, and Louisiana, have a longer coastline). This means that there are so many hidden nooks and crannies on the Maine coast, with charming coves seemingly around every corner. Take, for example, the new place we enjoyed this weekend: Deer Isle. You can see, based on the map, just how intricate and zig-zagging the coastline is. It seems that around almost every turn in the road there was another cove, dotted with fishing boats and sailboats, and small islands. Such beauty! And yet this is just one of literally thousands of islands off the coast of Maine! So there is always some beautiful new place to explore and discover – with coastal variation all along the way. But let me tell you a little more about our trip this time, with a few accompanying pictures. After enjoying an absolutely fabulous anniversary trip last weekend with my wife, Camille, in our all-time favorite – Mount Desert Island/Acadia National Park/Bar Harbor – we joined Camille’s two brothers, their wives and children, on a campout last night on Blue Hill Peninsula, with intentions to continue on to Deer Isle and Stonington this morning. 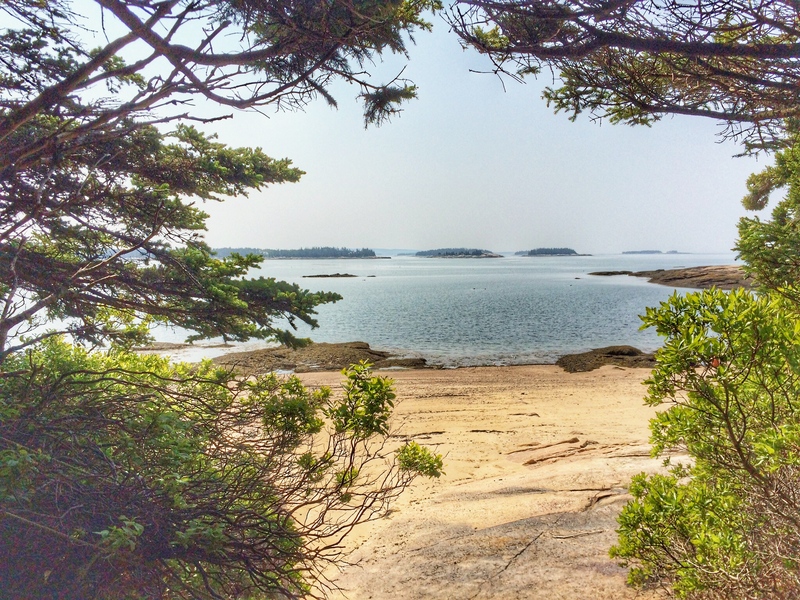 A word of explanation: Deer Isle is the major island which lies most immediately to the southwest of Mount Desert Island (MDI) – which is considered by many to be the “jewel” of the Maine islands, being the home of Acadia National Park. MDI is my wife’s and my favorite at this stage in our lives because there is so much to do with our kids: it has amazing hikes, spectacular coast, nice restaurants, amazing resorts. But it is, admittedly, very touristy. When we’re in Acadia, we seem to frequently be the only ones from Maine! 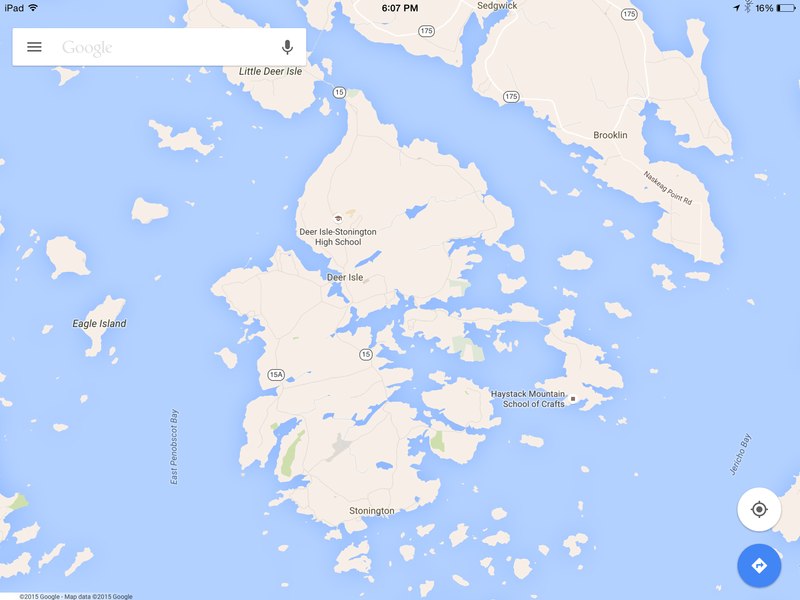 But Deer Isle, and especially its crowning town Stonington, is a whole other animal. It is frequently named as a favorite place in Maine for photographers and travel guides, but it is still very much unspoiled. Indeed, as I discovered, it is probably Maine’s most authentically charming place. 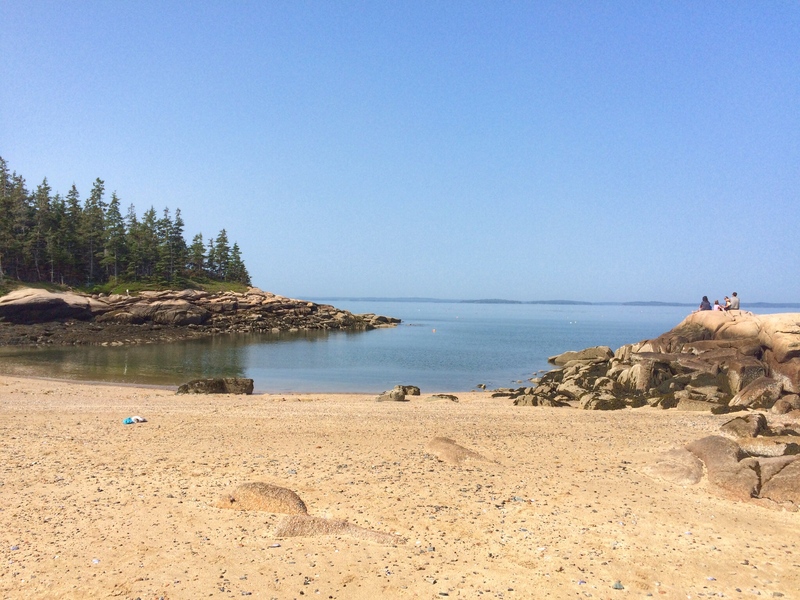 So when we woke up this morning, which, with a 15-month-old, was way too early (4 AM – or roughly the time when the light started making its presence known in our tent), we headed for Deer Isle. Our initial destination was a remote beach that my brother-in-law and sister-in-law rave about: Barred Island Preserve, located in Stonington. The drive there was worth the price of admission itself, practically. I am a hobby photographer and I know that lighting is everything! And the lighting was perfect during our drive (aided by two things: first, young children who wake up at first light when you’re camping; and secondly, paying close attention to the tide since we need low tide to enjoy Barred Island). My only regret was that we were unable to make any stops to take pictures! When we finally got to the end of the trail, which, with young children, seemed to take longer than a mile should, the sight that greeted us did not disappoint! There, before us, was a completely serene, idyllic, and lonely beach – created only by the low tide with water lapping the sand on both sides. It was all ours! The only noises interfering were the sounds of seagulls and a lone lobster boat setting out for the open waters. There was also a sail boat, just to the left of Barred Island, that was slowly moving across the horizon. The kids immediately got into their bathing suits and we all began to explore. These were the rocks just around the corner of the beach. Of course, there is one minor detail about the Maine coast that doesn’t sit well with many people: the water is very rarely warm. Such was the case today – with the temperature of the water probably around 55 degrees. But this didn’t stop the kids from splashing around the whole time we were there (with my littlest one, Winslow, in it practically the whole time). And Cameron and I, before we left, actually did go all the way in. It was cold but refreshing! Here’s one last view from Barred Island Preserve before we left after staying for about two hours. During our whole time there, there was one other party that joined us. But, other than that, we had the whole place to ourselves! And this was July 4 weekend! 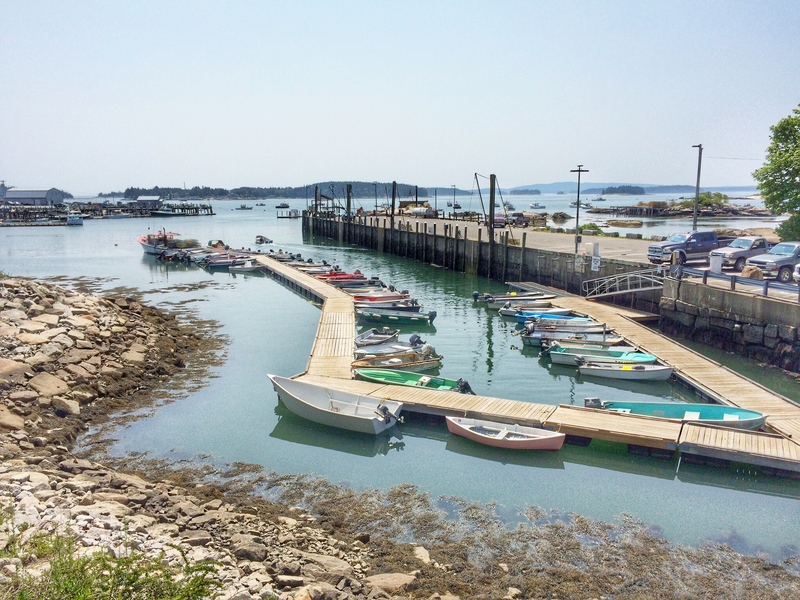 After we got back to the parking lot, we proceeded to Stonington – that famed fishing villages that has captured the imagination of so many. Before we even got to the downtown, we saw some spectacular vistas. Just beautiful. This is a classic Deer Isle – and coastal Maine – scene: a beautiful Cape style house overlooking an island-studded and rocky cove (the only thing missing are lupines, but those probably peaked a few weeks ago). Here is one of the first views of the actual harbor of Stonington. 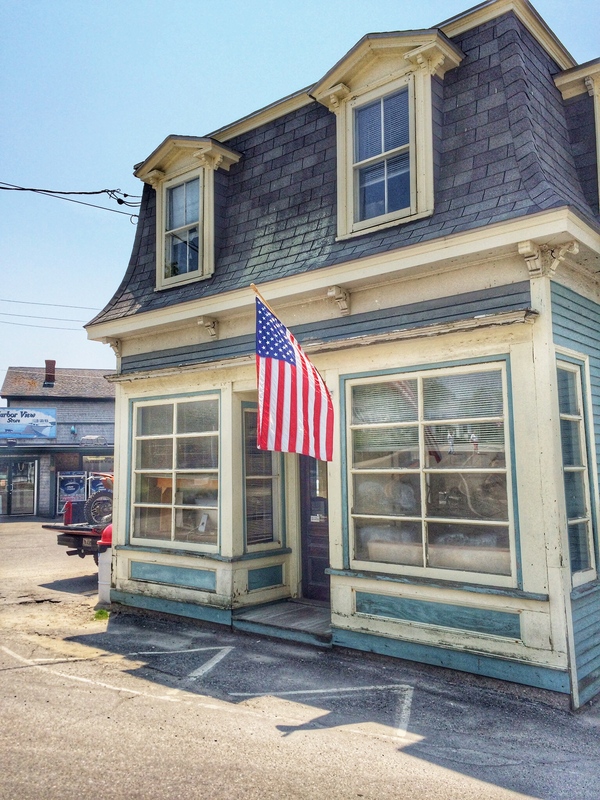 Unfortunately, we stayed in Stonington for a pretty limited time – and there was much else to explore. But I did have one neat experience during lunch: I met an old Mainer who was sitting next to us in the classic Maine diner. He was 88, having been born on Deer Isle and returning when he retired in 1991. He served in the Air Force for many years and then worked for the city of Lewiston, Maine. When I asked him what he did to stay busy these days, he said that he volunteered at his church. It turns out that he’s a deacon for the Advent Christian church – a denomination that is cousins to us Seventh-day Adventists. What I found most surprising is that he says that the little Advent Christian church on Deer Isle averages about 80 persons each week. I thought that was remarkable for that off-the-beaten path location! Here’s another shot of the harbor in Stonington. And a classic looking store in downtown, displaying its patriotism. As I said, we didn’t spend enough time in the village of Stonington. We must return some day. But as we drove out, this was our parting shot: you probably can’t appreciate it as much, but we saw a kayaker paddling off into the open seas. For good measure, we added a bonus on the way home: with the day being so hot, we stopped by our favorite swimming hole, Branch Lake, and spent about 30 minutes cooling off. Branch Lake, which is about 30 minutes from our house, is a beautiful and somewhat-remote lake that has a clear bottom. It’s simply gorgeous! So why do I love Maine so much? Because it seems like there is always something more to discover. And, even though Camille and I have our go-to place (MDI/Acadia/Bar Harbor) because it’s so family-friendly, I continue to be thrilled with making new Maine discoveries periodically! And here’s the very sappy spiritual lesson: Maine is like the Bible! No matter how much you experience it, there is always something more to learn and discover about it. Plus – and this one is not a stretch nor is it sappy at all – spending time in Maine, enjoying its unparalleled beauty in nature, truly revives one’s spirits. A couple weeks ago, my two brothers-in-law and I had the awesome privilege of taking an overnight cross-country ski trip to Baxter State Park – part of the legendary wilderness in northern Maine. I had been to Baxter a number of times before, but it was always in the summer months when the black flies and mosquitoes dropped with as rapid a pace from the sky as snow does in winter. Baxter is, indeed, wilderness – especially in winter. They have very limited winter access, with very few people in the Park. But my brother-in-law, Cameron, reserved us a cabin for one night. It was to be a five-mile journey in and, obviously, a five-mile journey back. Except for a few realities: my other brother-in-law Garrett and I had never cross-country skied before. And we didn’t quite give ourselves too much time in trekking in before nightfall. With limited service and information, it was a challenge finding the trailhead – especially with the gusting wind and pelting snowflakes. But we finally did find it. For the most part, the trip out was fine – after the initial adjustment period (consisting of about seven tumbles) that would be expected on one’s maiden voyage on cross-country skis. After two hours of skiing, however, and finally reaching the cabin, things got a little sticky. We soon discovered that the door was locked with a padlock, with no prospects of opening it. This was about two hours before sunset (though, on a snowy and cloudy day, it would get darker before that) and the wind chills brought the temperature down to a cool 15 below zero. We had a decision to make: either we somehow had to figure out a way to get into the cabin, or turn around and take the five-mile trek back to our car, with no time for a meal to re-energize. After considering our options, Cameron decided to pull out his cell phone to determine whether there was any way of reaching someone. You have to understand this about Baxter State Park, though: typically, as far as my limited experience has ever produced, there is only one place in the Park that one can get cell service: on the top of Mt. 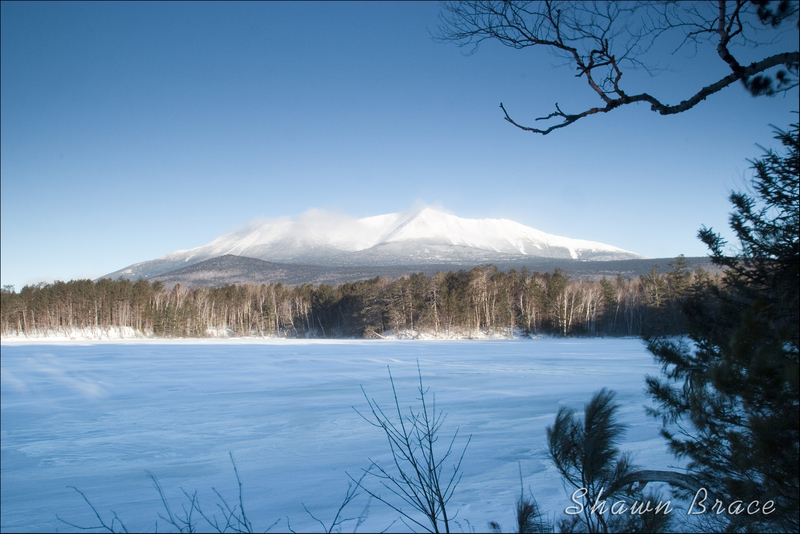 Katahdin – 13 miles in the other direction, and 5000 feet higher. Yet, for some reason, Cameron found a place near the cabin where he was able to get three bars of service. Because of this, he was able to call his wife, who gave him the phone number for the Park Headquarters. The Headquarters (which we had tried to stop in on our way to the Park, but to no avail) was closed. So Cameron then got the number for the Millinocket (the closest town to Baxter) police department, who patched him through to a Park Ranger on duty. After explaining our predicament, the Ranger gave us a few combinations to try, but with no success. Finally, the Ranger called another Ranger, who was patrolling the park on snowmobile, and he told him our plight. He then told us that the fellow should be at our cabin in 30 minutes to help us. Fortunately, we learned later, the Ranger had been patrolling very close to where we were. Had he not been at that time, it may have been a couple hours before he could have come. While we waited, all three of us crowded into the near-by outhouse, where it was at least sheltered from the wind. We ran in place to stay warm and talked about what our plan would be if the Ranger didn’t show up in a timely manner. We decided that if he didn’t arrive by 3:30 (30 minutes before sunset) that we would somehow break into the cabin. Fortunately, about 3:15 he arrived – replete with big, warm gloves, strewn with bear fur, and a blow torch. After trying the combination that the other Ranger gave us, which was also to no avail, he set the blow torch to it, re-tried the combination, and the lock slid right open. A few hours later, we were sweating in our wood-stove-warmed cabin, enjoying the literature of Henry David Thoreau, David Berlinski, and (much to my chagrin) Patrick F. McManus. The sweet melodies of Maine humorist Tim Sample, echoing from my iPhone, serenaded us to sleep. Incidentally, we later tried to call our wives back to update them on our safety, but none of us could get any service on any of our phones the few times we tried. AT&T came through for the few minutes that we needed it to. I don’t want to exaggerate the significance of the event, but neither do I want to downplay it. The truth is, had we been forced to turn around and go back to our car, five miles away, we could have suffered serious injury or loss. Or, had the Ranger not shown up at the right time, we may have also been in serious danger. With that being said, we were prepared, once we decided to stay, to get into the cabin using any means possible. And the Ranger (as well as the one who came to visit us the next morning) made it very clear that a little property damage would be excusable in exchange for our safety. They were, after all, the ones who were negligent. Apparently, for some reason, they overlooked our reservation and, since we were the first ones to stay there during the winter, they neglected to unlock the cabin for us. We woke up the next morning to clear, blue skies. It was still windy and cold, however, but I managed to brave the elements and capture a few pictures of Mt. Katahdin (with Togue Pond in the foreground). Man, was it cold as I set up and broke down my tripod! My only regret is that I intended to take a few sunrise pictures. But when I woke up at sunrise, I thought it was still cloudy. By the time I realized it was, in fact, sunny, the best light had retreated and I was stuck with the conditions in the picture above. Fortunately, during the winter, the sun doesn’t get very high in the sky, so typically one has at least decent lighting for almost the entire day. But I would have loved to have enjoyed beautiful pink, purple, red, or orange hues in the morning sky, had I been able to get out there early enough. The whole trip reminded me of God’s goodness – both in His works of nature, and His in intervention in the life of man. Tomorrow, I will conquer this mountain for the second time. Last year, right around this time, I conquered it for the first time. 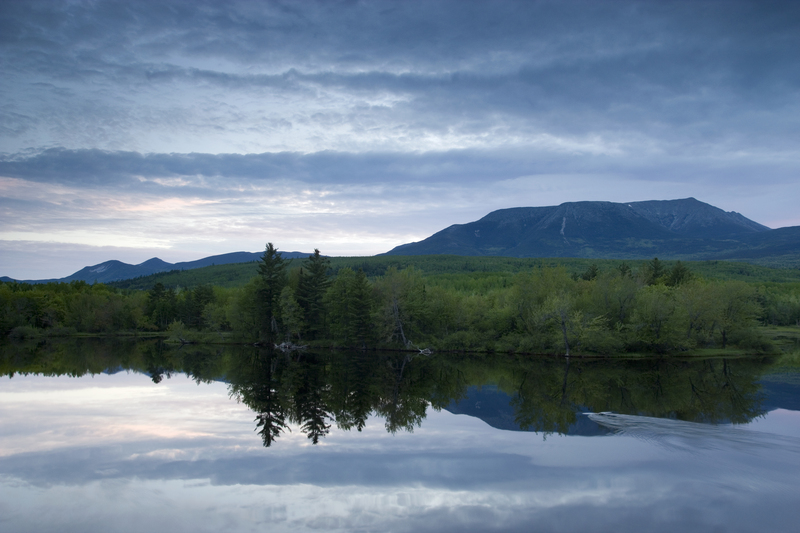 Towering above the Maine landscape at just 12 feet shy of a mile, it is a glorious mountain – the greatest mountain in America, East of the Mississippi River: Mount Katahdin (“The Greatest Mountain,” in Penobscot). I will be hiking with three of the most authentic Mainers you will find on the planet: 40-somethings who are bachelors and are the definition of Maine character and humor. I will also be hiking with my brother-in-law, plus another good and authentic New England friend, and then my Kiwi friend. Though I have only traveled to Baxter State Park, home of Mount Katahdin, a couple times, it has quickly commended itself to me as one of the most beautiful places on earth. Pure beauty – especially when Moose are roaming freely. Here is a Google Earth image of what we will be facing tomorrow – a view from Chimney Pond, which is about half-way up the mountain. "Not yet . . ."
Note: For the few of you who have actually stopped by my blog to take a look, you may have noticed that I’ve posted an incredible number of entries in less than 24 hours. That observation would be correct. This is due to a few reasons. 1.) It is the last week of my seminary schooling, and I am procrastinating 2.) More significantly, my wife is in Maine and I am by myself for the most part. Now, onto my story. I enjoy photography. That probably doesn’t come as a surprise to some people, but to others it may be something new. Photography is a lot of fun and it gives me a lot of pleasure. However, it sometimes persuades me to do things that I may not otherwise do – like wake up at 4 in the morning and drive 45 minutes to take pictures of a harbor that is filled with a few fishing boats and a lot of fog. Such was the case a few weeks ago. With a break from my seminary studies in Michigan, I spent a few days in a place I like to refer to as heaven on earth. For most sane people, this needs no further explanation. But for those of you who haven’t experienced the bliss of this wonderful region, let me spell it out for you: It’s called New England. I drove out to New England for the week to drop my belongings (including my wife) off, and to enjoy a little time with friends and family. 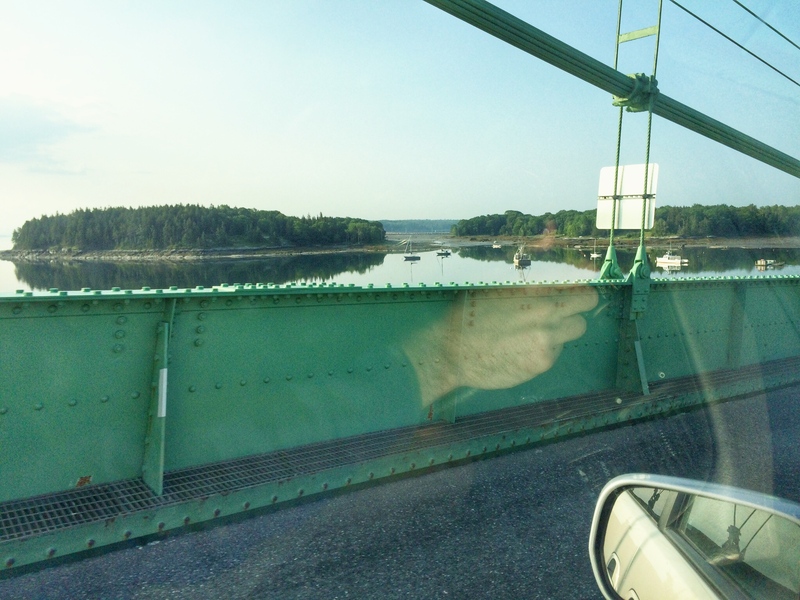 As the week neared its end, we found ourselves in wonderful Maine. It was here that I experienced the aforementioned 4 am wake-up. I decided I would explore the ceaseless coastline of this state (it apparently has more coastline than any other state in the contiguous US), camera in hand. My travels brought me to picturesque Five Islands, a very small fishing village about 15 miles south of Bath. The road there was almost as delightful as the destination. I passed by wonderful inlet scenes, complete with dories and schooners, alike. When I arrived in Five Islands, there was not a soul around and the fog was thickly hanging over the harbor. For most people, fog is a nuisance; for the photographer, it’s heavenly. The mood that it produces is unmatched. Seconds after I arrived there – the sky still dark from the lingering night – I set up my tripod and started snapping away. To be honest with you, I was kind of surprised that no one was around. After all, this was a working and active harbor and, although it was about five in the morning, I expected there to be fishermen preparing their boats for the day’s events. And then, after a few minutes of my uninterrupted shooting, an older gentleman showed up. He arrived in his old truck, parked it and then started moseying around the docks. Initially, I attempted to stay away from him. Although I am a fairly outgoing person, I am not one to normally approach people and strike up a conversation with them. But then, after trying to avoid having our paths meet for a few minutes, I could avoid it no longer. So I said hi, to which he responded in the like, and I felt compelled to ask him a few more questions. You know, the usual, “How’s it going?” “Are you going out on your boat today?” type stuff. Within seconds we had started a full-fledged conversation, complete with his delightful “Down East” accent (for those who are not from New England, “Down East” is the much-publicized region along the Northern coast of Maine). I don’t know why I avoided talking to him for so long. People like him are so interesting to talk with. They are full of stories and life experiences, eager to share a bit of wisdom they may have attained through the years. He told me that he was a lobster man and that he went out when he wanted to since he was semi-retired. He had a partner that he was waiting for, and they were going to decide if they would go out for the day. When he asked me if I was a professional photographer, I told him that I was a pastor and he actually seemed intrigued by that. At this point, how does he know if he will live his whole life in Five Islands? That type of witty and ironic humor is typical for Down Easters, but it was pleasant to experience it firsthand. What if we looked beyond the “not yet,” though, and believed that the “not yet” wasn’t necessarily inevitable. What if we really believed that God would return before our “not yet” was over. What if we really acted like we wanted Him to come before we experienced marriage, parenthood, retirement, or our deathbed longings for heaven. What if we stopped paying lip-service to the idea that we want Him to come soon. What if we actually did respond to Him whole-heartedly. What a difference it could make. And then we could go to be with God for a thousand years, and Christ could make this earth anew. And then it could all look like New England. “Even so, come, Lord Jesus” (Rev 22:20).